Okay, so I'm going to just go ahead and admit that I do not like football...or sports of any kind. But what I do like very much is good food, friends, family, and any excuse to combine all three into one gathering. And while I love to make intricate recipes from scratch, I also love to make quick and easy dishes for parties, easy finger foods especially. That is one of the best things about a football party; you can dial it down and serve something easy and yummy. It still has to be delicious of course. I try to avoid ordering pizza and tossing out a bag of chips. I'm not that lazy...most of the time. Here are some very quick and easy favorites that are perfect for watching the game. First things first, the guys need some meat. 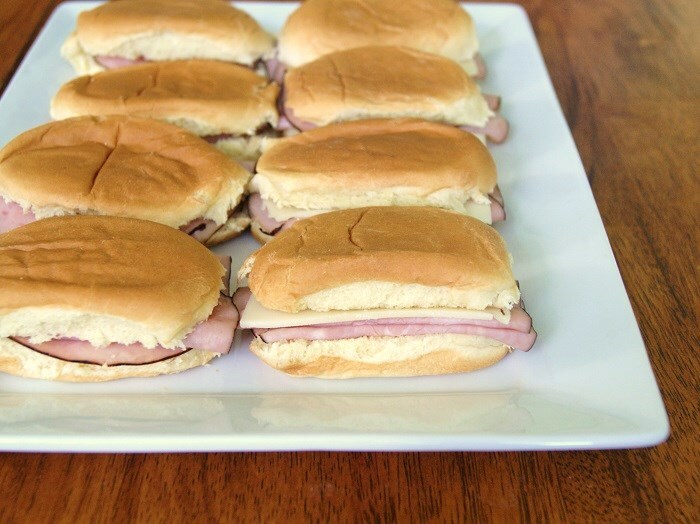 You could cheat with some pre-made sub sandwiches from the deli and slice them into individual pieces, or you can make mini sliders (pictured above) with Hawaiian rolls, Swiss cheese, and mustard. This is perfect for game day, because if you run out, it just takes a second to whip up some more. If you have a little more time and a big crowd to feed, throw some hot wings into the mix for the main dish. I thought grilled cheese dippers would be a great idea for game day. It's something different from the typical side dishes, and it's a total comfort food. I used Texas toast and mild cheddar for the sandwiches pictured above. Cut them into individual strips or triangles, and pair them with marinara dipping sauce. You could make homemade marinara, but the jarred store-bought marinara is just as good, so give yourself a break and pick some up from the grocery store. 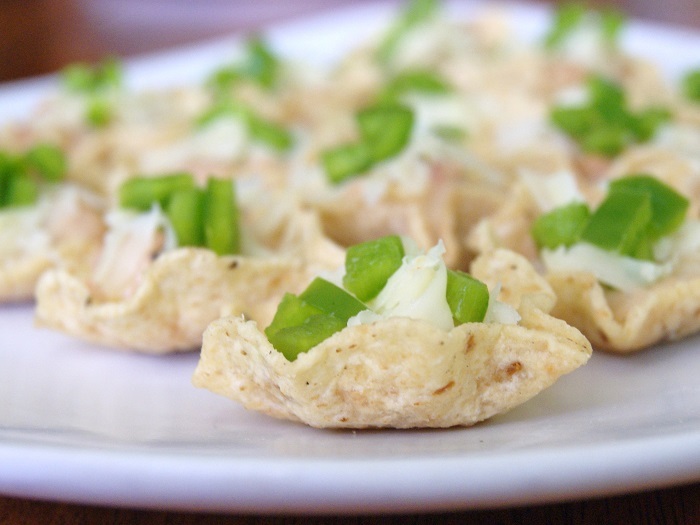 This next dish is the perfect hearty appetizer for a fall party, and it's so easy to make. I used Hormel white chicken chili and Tostitos scoops to make bite-size chili nachos. Simply fill each scoop with a spoonful of chili, then top with grated cheese, and garnish with diced peppers. I used pepper jack cheese and green bell pepper. 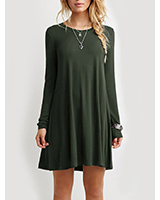 You could of course use jalapenos if you want it more spicy. You can serve as-is, but I highly recommend warming them in the oven, or popping them into the microwave for about 30 seconds. The chips get nice and warm and the cheese melted. It's pretty much heaven. 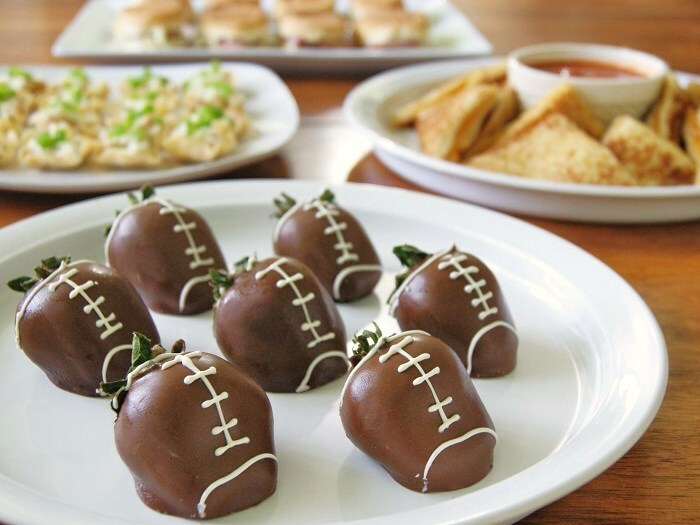 Dessert is the perfect opportunity to get a little festive with something football-themed. 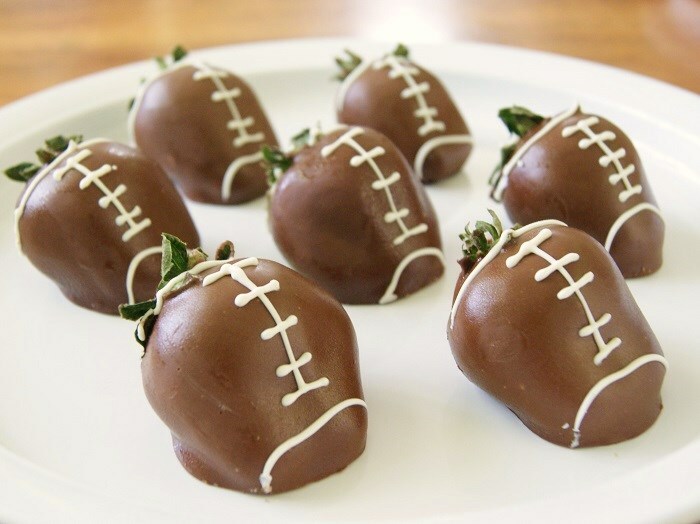 You can make something or pick something up at a bakery, or you could make your guests oooh and aaahhhh over some football chocolate-covered strawberries. 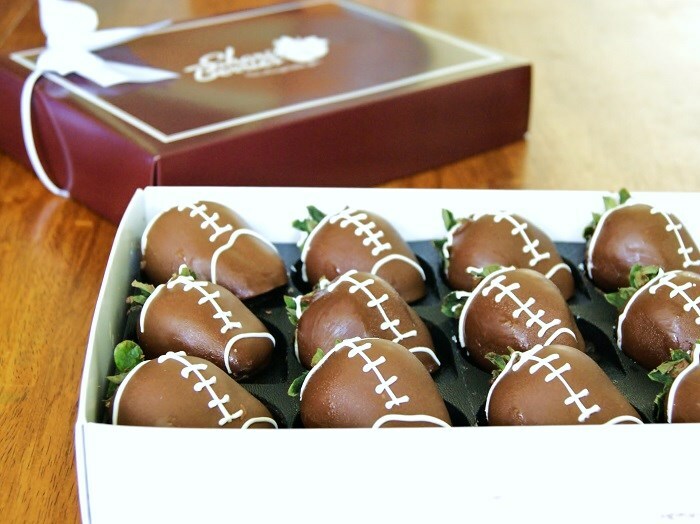 The Shari's Berries hand-dipped football strawberries come in a half-dozen, dozen, or two dozen. Chocolate strawberries provided by Shari's Berries. 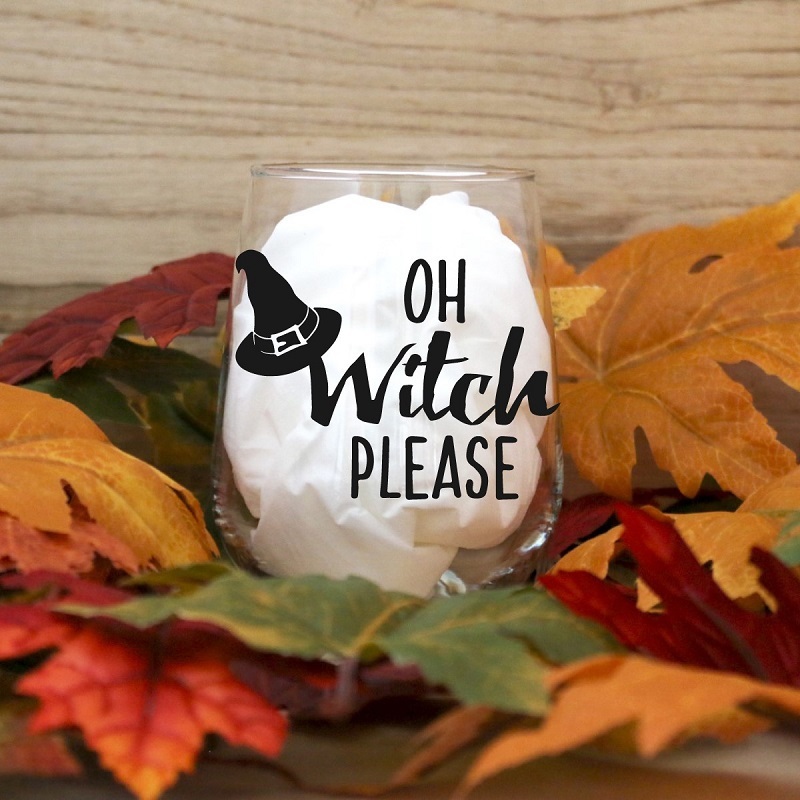 Save 20% on any order over $29 at sharisberries.com with coupon code BERRY20. You can see more of Shari's Berries current discounts here >. 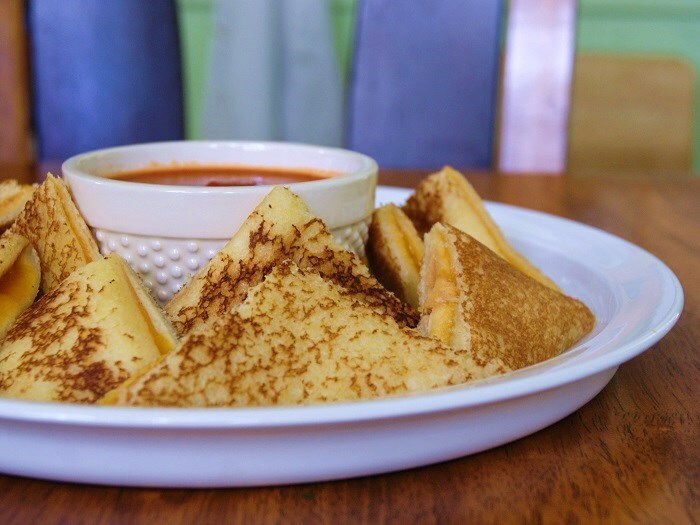 Grilled cheese dippers sound tasty! It all looks great. Got anything for us hockey fans?